Daniel (“Dan”) Cooper has been a practicing lawyer since 1990. Dan has spent his career as a litigator, representing both businesses and individuals in various types of cases including personal injury and wrongful death cases, automobile and trucking accidents, products liability, premises liability, professional negligence and malpractice, insurance coverage and insurance bad faith. Dan is a trial lawyer, having tried numerous cases in state and federal court. Dan has also represented clients on appeals before the Supreme Court of Appeals of West Virginia and the federal Fourth Circuit Court of Appeals. Dan’s practice is served well by his energetic and thoughtful approach to legal issues, his ability to provide clients with a candid and honest assessment of their legal concerns, and his zealous advocacy. In addition to his practice as a lawyer, Dan also serves the legal community as a mediator. His success in mediation is a product of his breadth of experience in litigation as an advocate for individuals and businesses in both prosecution and defense of legal claims, and his work on behalf of clients in trial, arbitration and mediation settings. In addition to his work for Cooper Law Offices, Dan works for the City of Bridgeport, West Virginia, as municipal judge. After his graduation from law school in 1990, Dan joined Steptoe & Johnson, PLLC, where he served the firm’s litigation and insurance clients until 2007, when he started Cooper Law Offices, PLLC. Dan is admitted to practice before all West Virginia federal and state courts, including the Supreme Court of Appeals of West Virginia, the United States District Court for the Northern District of West Virginia, the United States District Court for the Southern District of West Virginia and the Fourth Circuit Court of Appeals. Dan is a member of the West Virginia State Bar, where he serves on the Alternative Dispute Resolution Committee; the Harrison County Bar Association; and the American Association for Justice. Dan is honored to have an AV – Preeminent rating with Martindale-Hubbell, which means that he has been deemed to have very high professional ethics and preeminent legal ability. In addition, Dan is recognized in The Best Lawyers in America in the fields of insurance law and litigation, a recognition that he has received annually since 2009. Dan is also recognized by Super Lawyers in the insurance law and litigation areas, an honor he has received annually since 2009. Dan received his undergraduate degree from West Virginia University in 1982 and his law degree from the West Virginia University College of Law in 1990. While in law school, Dan was the Executive Editor of the West Virginia Law Review. 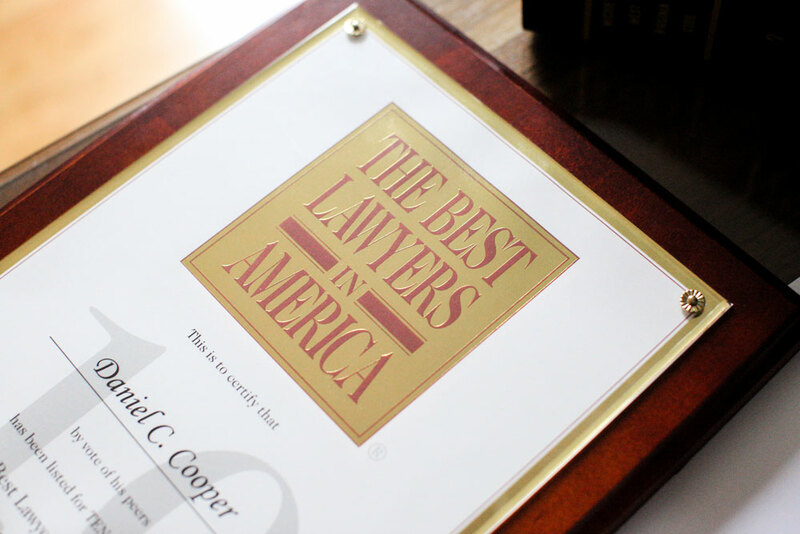 Dan Cooper has achieved a listing in Best Lawyers in America in the fields of insurance and litigation for ten straight years, from 2009 through 2018.